As part of the Experiences feature in our new Trips app, we’re bringing back the classic travel poster. Trips connects travelers with nearly 500 Experiences in 12 cities around the world. Designed and led by resident experts, Experiences aim to make travel magical again. Whether exploring Havana’s music scene with an award-winning vocalist or learning an ancient pottery technique in Tokyo, travelers will be able to immerse themselves in local communities. Experiences reflect our belief that there’s no better way to get to the heart of a city than with a local at the helm. With that in mind, we partnered with Koto, a London-based design studio, to find local artists to create iconic posters for 12 locations — Los Angeles, San Francisco, Miami, Detroit, Havana, London, Paris, Florence, Nairobi, Cape Town, Tokyo, and Seoul. Art directed by Koto and designed by illustrators who understand their cities from a local perspective, these posters portray a vibrant and accurate sense of place. 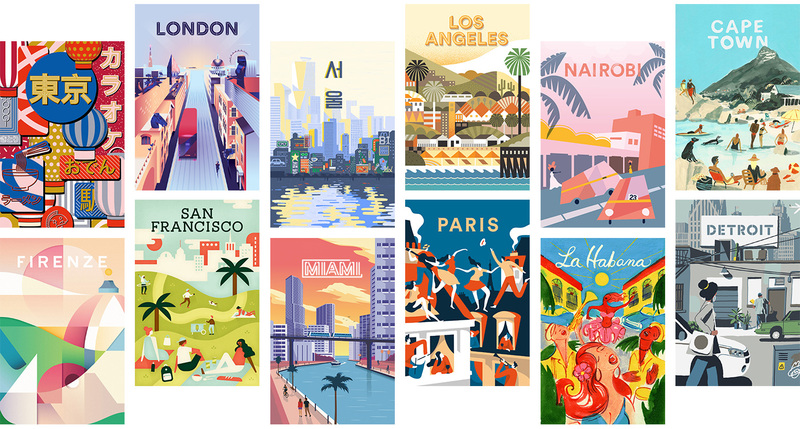 Touching on Airbnb’s broader mission to make travel magical again, the images harken back to the golden era of 20th-century travel posters when renowned artists created works for airlines, ocean liners, and the National Parks Service. These brightly colored images reflected the spirit of the destinations they depicted and inspired people to explore further. With our city posters, we’ve recreated that excitement and brought it into the future. From the image of Seoul’s Han River backlit by a neon skyline to the lyrical watercolor of Cuban musicians, each poster captures an insider’s unique perspective on their hometown.